Unfortunately, our Cambridge North Bus-Terminus service is not yet operating. Your booked dates will not reflect on the calendar. We provide sufficient e-bikes to fulfil all confirmed bookings. Click on the available days for which you would like a bike. Complete the form below the calender. Provide extra details about your expected pick-up and return times. Enter captcha, and click send. You will receive a thank-you message, followed by a booking confirmation. On some mobiles, the response to finger taps is a little slow. 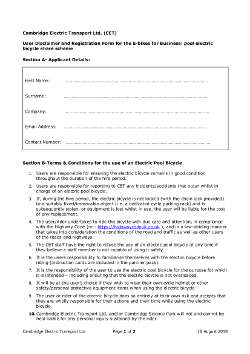 Please download a copy of our Terms & Conditions, print it, then complete & sign the two page document. Please bring the signed document with you, when you collect your first hire bike. Perhaps your colleagues would like to save time, riding a electric bicycle direct to your office. It would save them queueing to access the Science Park, St. John’s Innovation Centre, or Future Business Centre. The more people who use our service, the better our service becomes. 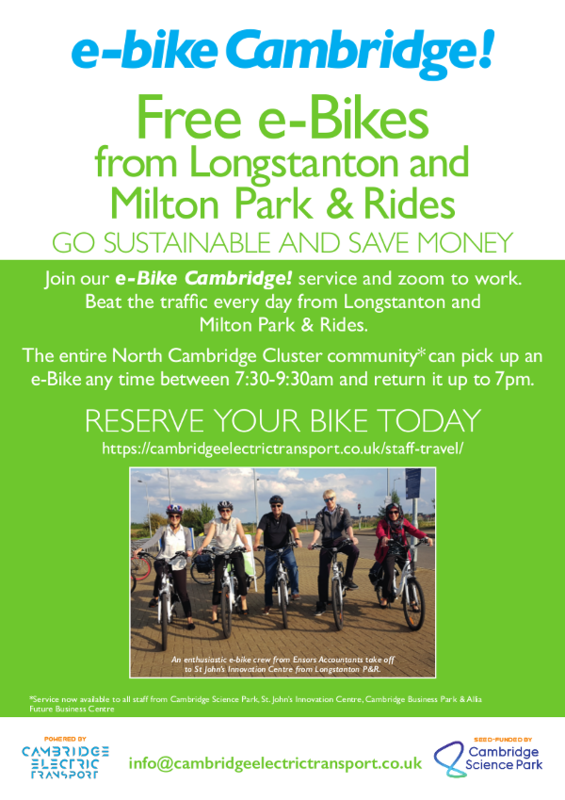 This website and its content is copyright of Cambridge Electric Transport - ©Cambridge Electric Transport 2019. All rights reserved.